Difficult. Obvious clues are not becoming apparent, had to resort to trial and error 3-4 times. I have been unable to do it without aids. I will have to try it with some aid. It is possible without guessing. Most of the corner areas are solvable to a certain extent, independently of each other. The least solvable is the lower left corner, but here you can find out that the only way the vertical 33 can work is going to be 1,2,6,7,8,9. With this info, you can find out that the 18 adjacent to it can only be composed of the lowest possible value for each of its three elements. That allows the bottom left corner to be solved. This then determines the combination making the vertical 26 in the middle of the puzzle, and once this is solved (based on finding the only value which works for the 19 crossing it) the rest of the puzzle is straightforward. Thanks a lot Chessmama. I'll try again with these suggestions. Another way you can do it is to first solve most of the top half, then add up the rows which sum to 7, 20, 6, 19 and 13, and subtract the columns which intersect those rows. 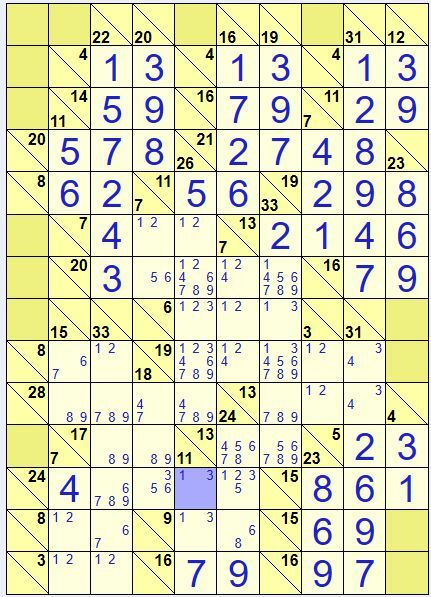 You can then figure out that the bottom squares in the 26 and 33 columns must sum to 18, and therefore they must both be 9. I mean, I am not saying such difficult games should not be posted. Of course different difficulty level puzzles must be posted every now and then. I see 90% of puzzles rated Easy by members' average, and only few Mild, even less rated moderate. 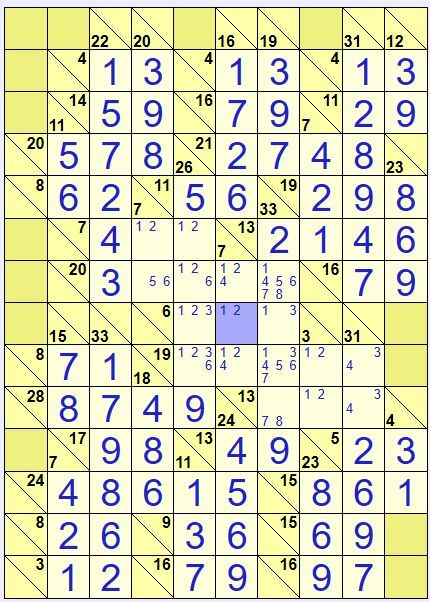 I have hardly seen and DIFFICULT, or HARD or Extreme, and I used to wonder that when learned members here find these puzzles easy that take me hours to solve, what kind of puzzle would they find hard. You wrote "vertical 33 can work is going to be 1,2,6,7,8,9." "With this info, you can find out that the 18 adjacent to it can only be composed of the lowest possible value for each of its three elements." if 17 has 8 in 18 column, then remaining digits of 18 should total to 10 giving 19 37 46 combinations. if 17 has 9 in 18 column, then remaining digits of 18 should total to 9 giving 18 27 36 45 combinations. 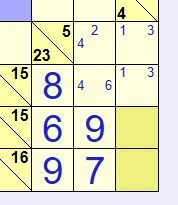 why should it give lowest values for each of 3 elements of 18? I had solved it, but I could find reasonable clues upto this point only. After this, I had to go though complex iterations and rough-shod trial and error. It is not a complain, just trying to learn how to identify simpler clues that I had missed. no obvious clue, but a simplest iteration tells that two 4s can't be there vertically so it can't be both 4. Those who are afraid of iterations can't go past this without iteration, so it would prompt and encourage them to learn iterations. You are almost there. The square to the right of the blue highlighted square cannot be 6 or more, because you cannot then make 24 vertically, so it is 1, 2, 3 or 5. But then the square to the left of the blue square cannot be 1, 2, 3 or 5, because then the maximum of those three squares (the highlighted plus the ones on each side) plus the 4 is 5+4+3+2 = 14, leaving no solution for the last square. So the one to the left of the blue must be minimum 6, but then the only solution for the 18 is 4+8+6. now as top cell has only possibilities of 45678, then these 123 have to be in the cell below (the cell right to the blue cell) and in case of 4+5, 4 is not a possibility in this lower cell, it has to be in the top cell and 5 will come below, so it will be 1235.
however it can surely not be 1-2.
and of course 4 for the other possibilities mentioned above. thus 18 down, can only have 47 in top, 89 in the middle and 356 in the bottom. removing 5 from there will also remove 6 from there, that will leave 67 in a single cell, so that is also not possible. that removes 7 and from 78 cell and leaves 8 there, and also fixes 1 and 5 as they are at one place only. it goes a long way filling several cells. I can do iteration, no big deal in this small set, still would like to learn if any method is there. * If you put 1, 2 or 3 in the first square, those four squares will be 1234 (i.e. sum to 10), which would require the 3rd square to be 9, which is not possible. * Similarly, if the 3rd square is 1, 2 or 3 then the 1st square must be 9, which is also not possible. Regarding difficulty, I suspect most (if not all) types of puzzles could be objectively rated based on the types of techniques needed to solve them. But it would be misleading to label these "easy" or "hard" etc. as those are pretty subjective terms. You could use something like 1-5 stars though. For me, "easy" means I didn't get stuck for very long, "moderate" means I got stuck for a moderate about of time and "hard" means I got stuck for a significant amount of time. to start iteration, I think starting with 3 down (1 2) or 31 down (3 4) iteration will be much more beneficial because they would quickly fix one another's values and would ripple through to remove 1234 across the rows and column, then any mismatch can be quickly identified. 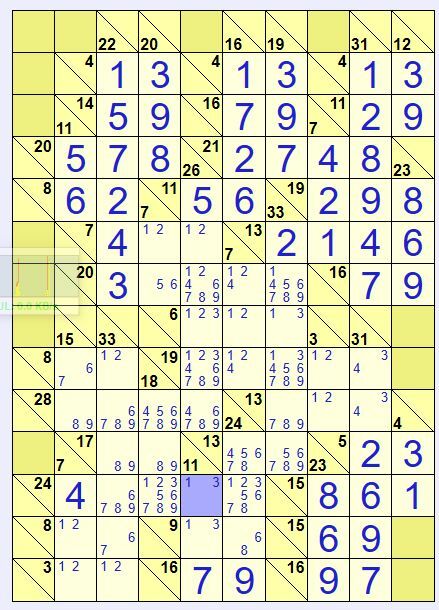 but yeah, previous "stuck" that I thought could be resolved by sudoku logic without going through iteration, but this one seems to have no clue and iteration is the only solution unless any member could find some way. The first two aren't possible (no 8 or 9). The fourth one also isn't possible (can't have both 5 and 7). Of the remaining two combinations, the 567 must go in the 1st and 3rd squares, while the other three squares must be 1-5. In fact, with either 12367 or 13456 the 1st square must be 6 and the 3rd square must be 5 or 7. With either combination there must be a 3, and the only place for the 3 is the last square in that row. Going back to average times and easy versus hard etc. I think, as Elisabeth says, that the only way to get a clear idea of how long a puzzle might take, or how difficult it is, is to look at the results table. Times and levels of difficulty are so skewed by people using aids and finishing a puzzle really quickly, then calling it easy. be it 12367 or 13456, in both cases, 5 or 7 are going to come in a single cell. that leaves 5-1236, 7-1346, and 6 can only be in a single cell. filling that up gives 12 12 123 so 12 pairs out filling 3rd cell with 3.
going on, that leaves 33 down with only possibility of 678. that gives it the final push to crumble. yes. this is also logic, no iteration required. Now I can sleep happily otherwise it would have come in my nightmare. Also, don't forget that if you tick 'Show current clue fits' then the player will show you which possible number combinations fit for a clue. It also crosses out those that won't fit based on existing placed numbers, although it doesn't consider what will fit compared to your pencilmarks since it doesn't know for sure that you have placed all possible pencilmarks. On difficulty ratings, I actually have very accurate ratings for almost all of the puzzles on the site, but as you know it only shows ratings averaged from player scores. It's been interesting how most people don't rate the puzzles accurately - it must be a psychological thing. Now, as the 24 across has: 4 (given) and possibilities 6789, 12356789, 13, 1235"
*IF* the second of the cell possibilities you give (12356789) had any of the values 1, 2, 3 or 5, then that cell plus the two following cells could *maximally* be 2 + 3 + 5. Add that to the 4 you already have gives 14, and then the last cell (6789) would need to be 10 to make 24. *Therefore* this cell *cannot* be any of 1, 2, 3 or 5. It is a more advanced logic than simple exclusion: it's exclusion based on a maximum sum of possible values. But you don't have to iterate. 12 can come from 7+5, (Edited: 8+4, no 4 is already there), 9+3 combo"
In order to get yourself in a position to make a two cell 12-combo, you had to "assign" 3 and 5 to two unknown cells. That then stops both of your possible combinations of 7+5 and 9+3 for the other two cells. Therefore some part of the assumption that the two cells you "guessed" are 3 and 5 must be wrong. This was not a moderate puzzle in my opinion. This was fairly difficult.